Are you looking for a reliable eye doctor in the Gainesville, FL area? Are you interested in LASiK surgery or are experiencing an undisclosed and undiagnosed eye disease? The professionals at Eye Surgicenter can provide you with all your needs. Call today to schedule an eye exam! An eye doctor at Eye Surgicenter can provide you with cutting-edge eye care in the Gainesville, FL area. From your eye exam to the need for eye surgery, we have earned the trust from our patients as the most reliable eye doctor in the area! If you feel that you are experiencing an eye disease, an eye doctor can assist you through the process of treating it. Interested in LASIK surgery? We can provide you with all the information necessary and see if you are a viable candidate for it. Whether you are experiencing issues or are looking for ways to improve your vision, give our office a call today! Eye health is very important. Even if you haven't seen an eye specialist for a routine exam in years, there is no better time to make an appointment and have your eyes evaluated. An eye doctor at Eye Surgicenter will check for any serious eye concerns and ensure everything appears normal. Stop in for services ranging from a routine eye exam to eye surgery! "If you can’t see what you’re looking for, you’ve come to the right place.” Keeping this motto in mind, the Surgicenter staff will do everything within their power to present patients with a wonderful clinical experience! As a parent, you want to assure your child has the best vision possible, which is why it is important to get them to the eye doctor regularly. According to the American Optometric Association, children should have their first eye exam around 6 months old. Children should continue to receive a routine eye exam when they enter preschool, kindergarten, and throughout childhood. It's estimated that 25% of school-age children have vision problems. The sooner that your eye doctor can detect these problems, the sooner a plan can be put in place to improve your child's eye sight. Poor vision can affect your child's ability to learn and succeed in school. By making an eye appointment early for your child, you can catch any vision issues as soon as possible. All members of your family should receive periodic eye exams to check for potential problems. Your eye appointments are just as important as a yearly trip for a physical. For adults, eye exams can usually be held every 1-4 years. If you are experiencing problems or have a family history of eye disease, it is important that you go to see an eye specialist sooner. If you haven't seen an eye doctor for your regular appointment, come in to Eye Surgicenter of Gainesville, FL today! Are You Interested in LASIK Surgery? The eye doctors from Eye Surgicenter are experienced and very knowledgeable when it comes to LASIK procedures. If you're ready to have a discussion with your eye care specialist regarding LASIK surgery, we are here to listen. If you have questions or concerns about the procedure, one of our doctors will be able to address them for you. We offer comprehensive eye care services. Our eye doctors can provide eye exams, eye surgery, LASIK surgery, and more. If you are experiencing problems with your vision, we recommend that you get yourself checked immediately. We serve patients in Gainesville, FL and the surrounding areas. We are equipped with the most advanced technology to diagnose and treat eye problems. If you want more information about our LASIK surgery or need an appointment with us, call us today. Wearing glasses or contacts can become a hassle over time. Wouldn't you love to wake up without needing to reach for your glasses first thing in the morning? Having less than perfect vision is something that many Americans deal with. The good news is that there is a solution to your vision woes. You can learn more about your options with LASIK surgery by speaking to one of the eye care doctors from Eye Surgicenter. We are a trusted provider of LASIK in the Gainesville, FL region. Make your appointment today and let us help you see without your glasses or contact lenses! If you have any questions about LASIK, you can visit the LASIK FAQ page on our website. Here, you'll find some of the common questions that our eye doctors receive and our answers for you! If you have any additional questions or concerns, please don't hesitate to set up a consultation at Eye Surgicenter! Cataract surgery is the removal of the natural lens of the eye due to a developed opacification. An opacification is referred to as a cataract. Cataracts can be better understood as the clouding of the lens inside the eye, which in turn causes vision loss. Cataracts are most common to people above the age of 50 as cataracts are associated with aging. Modern cataract surgery can usually restorn vision that was lost due to cataracts. If you think you may need cataract surgery, get in touch with our knowledgeable eye doctors to learn more. Schedule Your Eye Exam with the Most Reliable Eye Doctor Today! 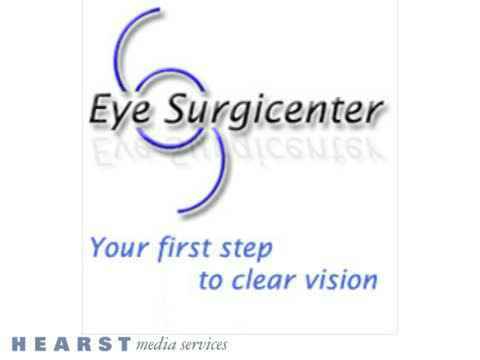 For total eye care, choose Eye Surgicenter of Gainesville, FL. Our team of eye specialists provide routine procedures, consultations on any eye disease, eye exams, and cataract surgery & LASIK surgery. To make your next appointment, call our office today. Our professional eye doctors look forward to serving you and your family. Trust an eye specialist at Eye Surgicenter with your eye exam and more! From contact lens fitting to LASIK, every eye doctor we employ would be proud to be your partner in optical health. We offer no-stitch cataract surgery, glaucoma surgery and more.